Station Hollywood: Mukeshji's voice still haunts listeners. Remembering Mukesh on his death anniversary. Great singer Mukesh is remembered both on his birth anniversary on 22nd July, 2016 and death anniversary on 27th August, 2016. The viewers of bollywood films remember legendary singer Mukesh on his death anniversary on 27th August, 2014. He was born on 22nd July, 1923 and died on 27th August, 1976 and people all over the world remember his great works. Mukesh was probably the most popular singer of the 50s, 60s and 70s after Mohammad Rafi. His nazal tune had huge amount of sensitiveness and he gave expression to brilliant composers of the golden age with the romantic voice. His combination with Showman Raj Kapoor was considered one of the golden combinations of the 40s, 50s, 60s. His notable songs for Raj Kapoor included “awara hoon” from film Awara, composed by Shankar Jaikishan, “aaja re” from film Aah, composed by Shankar Jaikishan, “ramaiya vasta maiya” and “mera joota hai japani” from film Shree 420 composed by Shankar Jaikishan, “sab kuch sikha humne”, “dil ki nazar se” and “kisiki muskurahaton pe ho nisar” from film Anari, “ai sanama jish ne tujhe chand sa surat di hai” from film Diwana, “sajanwa bairi ho gaye hamar”, from film Teesri Kasam, composed by SJ, etc. The list can go on. 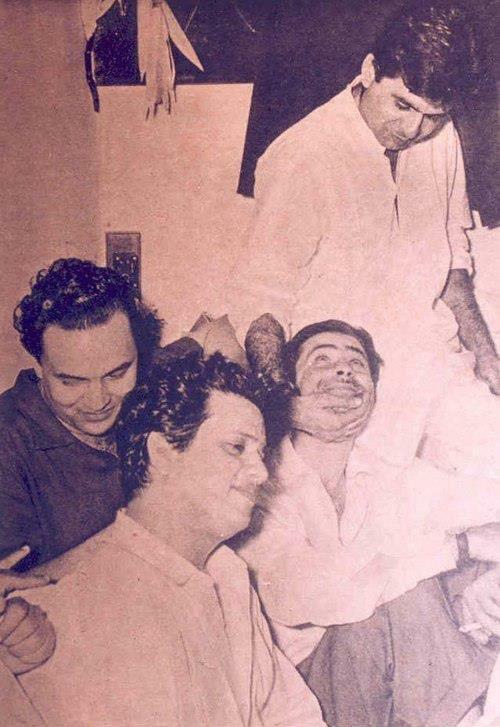 Shankar Jaikishan stormed bollywood films with their everlasting tunes for more than 25 years, and wherever they were associated with Raj Kapoor, Mukesh sang the songs of his lifetime. The combination gave everlasting hits in films like Barsaat, Jis Desh Me Ganga Behti Hai, Sangam, Ek Dil Sau Afsana, Around the World, Diwana, Teesri Kasam, Mera Naam Joker, to name a few. In non-Raj Kapoor films also Mukesh did a superlative job. His performance in Dilip Kumar’s Madhumati, composed by Salil Choudhury, Manoj Kumar’s Hariyali Aur Raasta composed by Shankar Jaikishan, Rajender Kumar’s Saathi composed by Naushad Ali, Manoj Kumar’s Pathar Ke Sanam composed by LP, require special mention. Some of the notable songs of Mukesh which had remained immortal in those films included “dil tarap tarap ke kehrahahe aabhi ja” in Madhumati, “ifteda-e-ishq me” in Hariyali Aur Raasta, “mera pyar bhi tuhe” in Saathi, “tauba yeh matwali chal” in Patthar Ke Sanam, etc. He died in 1976, and ended the era relating to soft romantic songs. His journay from the film Nirdosh in 1941 to Amar Akbar Anthony in 1977, remained unblemish. In 1974, he received national award for best singer for the song “kai baar yun hi dekha hai” from the film Rajnigandha, composed by Salil Choudhury. He deserved many more national awards, as he had sung from his soul bringing tears in the listener’s eyes. Besides he received filmfare awards for his best performance in films like Anari, Pehchan, Beimaan, Kabhi Kabhi. Even in the 70s, when slow music gradually lost its predominance, Mukesh’s songs in somber mood like “mai pal do pal ka shayar hoon” and “kabhi kabhi mere dil me” in the film Kabhi Kabhi composed by Khayyam and written by Sahir Ludhiyanvi created a permanent place in the hearts of millions of musiclovers. Articles after articles can be devoted on the successful combination of Mukesh with Shankar Jaikishan, Salil Choudhury, Naushad, Roshan, and others. His films and songs should be preserved.